BBC launches new iPlayer on Sony PlayStation 3 | What Hi-Fi? The BBC is today launching a new HTML 5 version of its iPlayer on Sony's PlayStation 3. Featuring a new on-screen design, custom-built for the living room, the latest version "gives audiences the control they want directly on the TV", says the Beeb. Viewers can now flick through channels while watching TV, use the improved search functionality to find the programmes they want more easily, and personalise iPlayer with their favourite programmes. 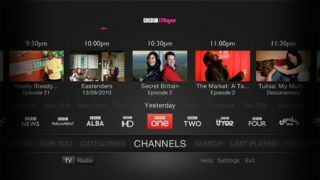 Although launching initially on the PS3, the new iPlayer will be coming to many more connected TV devices in the next few months. You can find out more in this BBC blog. Daniel Danker, BBC's general manager, programmes & on demand, says: "BBC iPlayer has been tremendously successful. With today's announcement, we're transforming iPlayer in its most natural home: on the living room TV." BBC iPlayer is now available on more than 300 connected TV devices, including games consoles, Freeview HD and Freesat HD set-top boxes, internet TVs, Blu-ray players, and pay-TV platforms such as Virgin Media and BT Vision. The number of iPlayer programme requests on connected TVs increase more than five-fold from December 2010 to July 2011, growing from 579,000 to 3.1 million requests in July.